Check Current Watches, Warnings and Advisories for Georgia from the National Weather Service. View current conditions live via webcams at Brasstown Bald on the Chattahoochee National Forest. National Weather Service current weather, plus forecasts for fire, drought, and real-time surface water flows in Georgia. MesoWest Current Conditions - Visit the website to view RAWS current information from monitors stationed on the national forest. 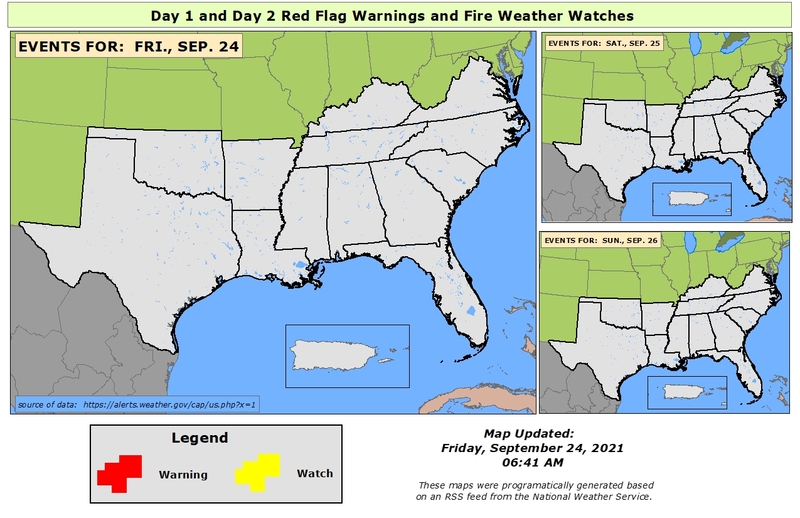 Updated daily by the Southern Area Coordination Center (SACC), this map shows Red Flag and Fire Watch alerts by the National Weather Service. The map displays watches and warnings up to three days in the forecast period and are depicted by unique symbol. This allows you to see charts and tables of stream discharge (how much water is flowing), gage height, and precipitation for streams and rivers in Georgia. Provided by the U.S. Geological Survey.